Often in Omis with beautiful sunsets like this, you’ll see couples in love strolling along the river, but there is a story of a woman who walked the banks mourning her unrequited love. September 2015, panorama from 4 vertical images, additional exposures for highlights, focal length 16mm, aperture f/8, exposure 15 seconds, ISO 250, 5-stop ND filter, tripod. This is the tale of a lower class “vlah” and the daughter of a noble family. During a bura, a treacherous storm, the young man, Frano, was serving as a guard. Sitting around Frano told his fellow guards he planned to see Mihaela from the prominent Didic family for a secret rendezvous. Seeing the candle lit in Mihaela’s room across the river, he got a row boat to cross. He never made it to see Mihaela that night. Rumor had it like many others Frano died during the storm, and Mihaela could not reveal the truth to anyone. Part of why I return to Omis is the rich stories behind the exquisite scenery. 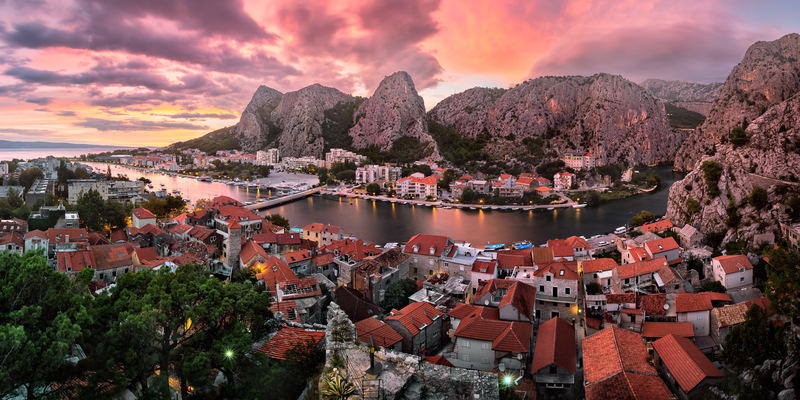 In September 2015, I made a quick trip to Omis when I captured this spectacular panorama. Arriving just before sunset, I quickly setup at Mirabella fort, a place known for the best views of Omis Old Town and Cetina River. With so many details in both foreground and background, I decided to remove details at least from the river and used a long exposure to smooth its surface. Therefore river become a prominent separation line between foreground and background and fascinating composition element. As I was putting on the 5-stop ND filter on my lens, the sky began to glow with unbelievable colors. On the first exposure the sky become an infernal red. By the next exposure the city lights went on to add onto the scene. Shortly after the colors in the sky began to fade for the remainder of the shots. The exposure you see here is at the golden moment when the sky glowed red with the city lights on for a brief, yet perfect, moment. This entry was posted in City and tagged Croatia, Omis Riviera.